With the NEILA Player you can select media files in a folder and play them easily. You can modify playlists on-the-fly which includes adding media files, removing, inserting after the currently played and inserting prior a selected one. On the WPS (While Playing Screen), you can see the decoded meta-tags from the media file like e.g. artist and title. Here you can find a short demo video on YouTube showing the NEILA Player in action. Video of the NEILA Player connected wirelessly to a SuperTooth Disco Bluetooth loudspeaker. Hint: Maybe not all formats are supported by your device. On the "Files" tab you can select a drive and see the containing folders, playable media files and playlists. Folders are marked with a folder icon. First you have to select the drive where your media files are located. Usually this is drive E or if a memory card is installed, drive F.
Now you can browse through the folder structure by a single click onto the desired folders or ".." to go up one level in the directory structure. If you double click a media file, a playlist containing all files from the current folder gets created and playback begins from the double clicked file. On the "WPS" (While Playing Screen) tab you can see the decoded meta-tags from the currently played media file like artist, title, genre and many more. By moving the slider, you can seek to the desired position in the media file. On the playlist tab "PL" you can see the playlist. The currently played media file is marked with a play icon. To remove files from the playlist, select the desired file(s) in the playlist and open the "Options" menu to find the right action. If you want to continue playback directly from another position in the playlist, simply double click the desired media file. Searches and finds all files in the choosed drive which contain the entered text in the file name. In the "Settings" tab you can find a slider to set the desired volume. You can also use the media keys on your device to set the volume at any time, even if the NEILA Player resides in the background, the screen saver is active or the display is turned off. If you select one or more files in a tab, dynamical sub-menus appear. Insert before selected Inserts the selected media files from the "Files" tab just before the selected file from the "PL" tab into the playlist. Hint: The files keep the same order as you selected them. Insert next Inserts the selected media files from the "Files" tab just after the currently played file into the playlist. Add Adds the selected media files from the "Files" tab to the end of the playlist. Shuffle Shuffle the current playlist. Clear Completely clears the playlist. Save Save the current playlist. The default folder is the same as showed in the "Files" tab. Find a previousely saved playlist (*.m3u) in the "Files" tab and double click it to load it. As soon as a phone call comes in or you make an outgoing call by yourself, playing pauses automatically and resumes as soon as the call ends. 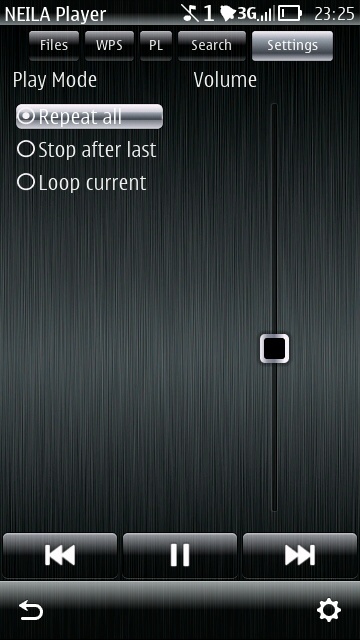 For the screenshots on this site, the free theme "SteelBlack Silver DFLT" from the Nokia store was used.